Growing up, my mom made a lot of meals that seemed like they took so much work! She sure as heck fooled me! 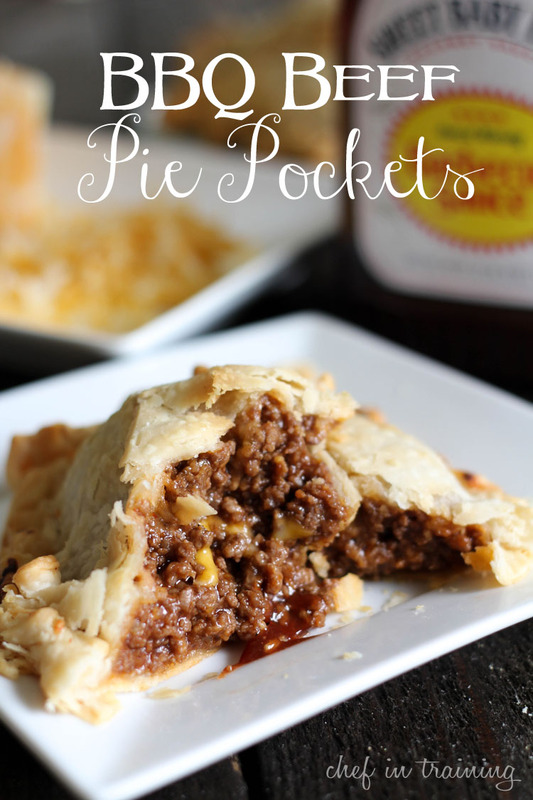 These are packed full of meat, BBQ sauce, and cheese… everything my husband adores. It is a man pleaser meal… but I think my 3 year old scarfed her portion down faster than my husband did… and that is saying something because my husband scarfed down his pretty dang fast. Every time I make this dinner, my husband “ooo”s and “awe”s with every bite. If you were sitting in listening to him eat it you might think he hadn’t eaten in days. A man-pleasing meal that your whole family will love! Whips up in a matter of minutes! Cook ground beef in a skillet until browned and cooked through. Drain out juices. Pour BBQ sauce into pan and stir until ground beef is evenly coated. 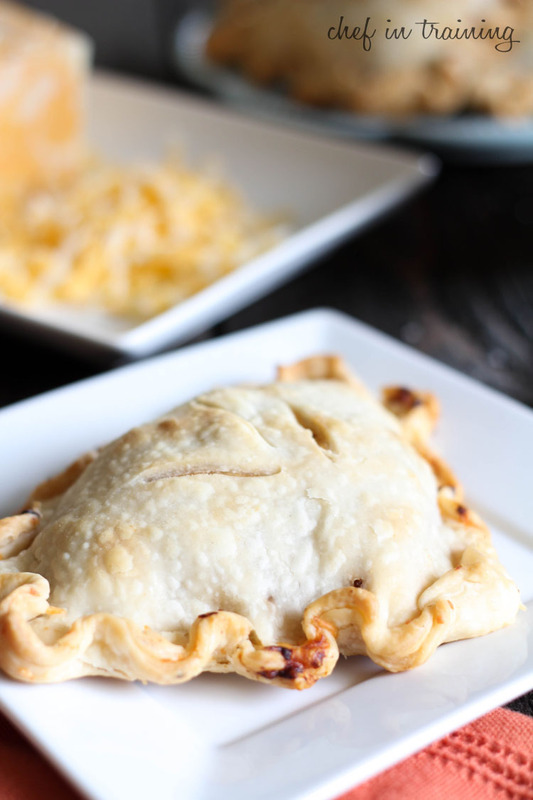 On one quarter of pie crust dough, put ¼ of ground BBQ beef (about ¾-1 cup.) Then sprinkle on ¼ cup shredded cheese over top of the beef. Place a second quarter of pie crust dough over the top (make sure it lines up with bottom quarter) and pinch seams to seal off. You can flute the pie crust edges for a prettier look. Repeat until you have 4 pie pockets (or more if you cut your pie crusts into smaller sections). Cut about three small slits on the tops of each pie pocket for breathing. Bake at 425 degrees F for 25 minutes or until tops are golden brown. Simple simple and simple! Ok, they look amazing as well! I love tastey, easy meals! This sounds so great Nikki, I am making this tonight! This is so something my husband would love too! This picture has me drooling. I think i`ll scarf this down quickly too! I love this! I only use their pie crusts too!! My grandmother would be so disappointed, but they are always perfect. Thank you so much for sharing! I'm pretty sure I would scarf this down too! Love your blog! I found you through Pinterest and I knew subscribe through FeedBurner! I have pinned so many of your recipes and just love making your recipes!!! Thanks for sharing! I made these last night & my husband LOVED them! He said add them to our dinner rotation, LOL! Thanks for posting the recipe!! I am soooo making this next week! This looks great!! I've always been pleased with your easy FAMILY & KID FRIENDLY recipes! I can't wait to try it. We needed a new beef recipe in rotation. Maybe some sweet potatoes fries on the side! This was so good! My husband and toddler both loved it. I love ideas like this. Because I immediately think of all the variations.. Pizza sauce & mozzarella, salsa and taco fixins for a Mexican flare., even could so stir-fried veggies with teriyaki sauce for a vegetarian one. Boy, I think in a matter of minutes I could come up with a week of these, different every night. Thanks!! I made these 2 nights ago. Followed the recipe exactly as written. Put them in the oven and set the time for 20 minutes. When I came back, the pie crust pocket was so brown - almost burnt. They were totally ruined. I thought my oven temp must be off, so I went an bought an oven thermometer. My oven temp is perfect - so not sure why mine did not look like yours. I will probably make again, but next time I will lower the temp to 350 and see if that helps. Made the tonight, delish :) Mine were not as pretty but they were great! Thanks for a wonderfully simple meal! These look great!! Do you think you could freeze these? Have you ever tried? These look amazing! I am always looking for new ways to use ground beef. And I love anything BBQ. Put it all in a pie crust and I think I am in heaven. Thanks for sharing! Made these tonight and they were really good! Mine weren't as pretty as yours but we will be making again!! I plan to make these tonight! How do you flute the edges? These were so easy, cheap and my entire family loved it!! New family favorite! Thank you for sharing!!! Added chopped onions to the hamburger meat and it was a big hit with the family. Thanks for the recipe! I make something like this called BBQ cups. I brown the ground beef and then add onion flakes and BBQ sauce. Instead of using the Pillsbury pie crust I use any flavor of Pillsbury biscuits. I then place each biscuit in a cupcake pan and fill it up with the ground beef filling and top with whatever shredded cheese I have on hand (which is usually cheddar). This recipe was so simple and it was amazing! Thanks for sharing! this sounds wonderful..........going to try it out this week. Turned out great, thank you! Sounds delicious. Thank you. Have a great weekend! What do you suggest to serve with them? Made these tonight using 1/2rd pound beef, a finely diced carrot, and 1/3rd of a large onion (finely diced). It only needed 1/3 cup cheese and 6oz BBQ sauce. I can't imagine the mess 18 ounces would have made in my oven! It did taste good. Thanks! Made these for dinner tonight and they were DELICIOUS. I used 1 lb of beef, and added in 1/2 a large onion, diced, and a can of black beans, rinsed and drained. A ton of potential by changing up the spices and even the meats - you can do taco spices, indian spices (for a samosa type pocket), greek spices, etc. Thanks for a great recipe! Made these tonight with ground chicken since we don't eat red meat - amazing. And so so customizable. Thanks for the recipe!